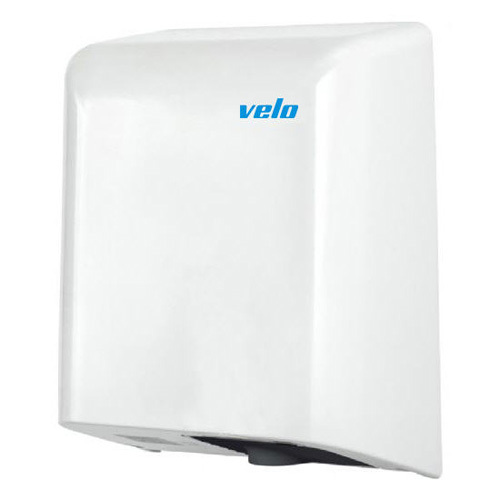 The Velo Fuga is one of the fastest and most energy efficient hand dryers in the world. It has a modern European design and extremely competitively priced. It’s ideal for high traffic areas including hels, airports, clubs, universities, sports stadiums, shopping malls, offices and cinemas. One of the fastest hand dryers in the world. Dimensions: 324 x 253 x 156 mm. Total electric power: 800 W.
Approximate drying time: 10-12 seconds. Casing: Steel casing 1.2 mm or ABS plastic for black, blue & red Fuga models. Casing finish: White epoxy or black, blue and red ABS. Steel casing. 1.2 mm thick. Dimensions: 324 high x 253 wide x 156 deep mm. Product Code: ZS Quantity: 4 per box. Recommended to change filters every 3 months to maintain efficiency of bad smell neutralization.